As I write this, two key questions remain unanswered, and a third mostly unasked, about a deadly daybreak attack on Khan Sheikhoun, a northwest Syrian city of (pre-war) 50,000. Hundreds were wounded and as many as 100 killed, apparently chemical weaponry (Turkey’s health ministry believes the agent in question was the nerve gas sarin), on the morning of April 4. The US government (and unfortunately most American media, acting as stenographers rather than journalists as is too often the case in matters of war and foreign policy) have settled on the regime of Syrian president Bashar al-Assad as the culprit. That claim seems very questionable, if for no other reason than that there’s no plausible “why” attached to it. After more than six years of civil war, the Syrian government has (with Russian assistance) turned the tide. Assad is well on his way to defeating both the Islamic State and the “moderate rebels” (read: al Qaeda) backed by the US, restoring his control over the country. A chemical attack on Khan Sheikhoun doesn’t seem to fit into that scenario. Not only does it serve no obvious military objective, but it’s precisely the kind of atrocity that American hawks will latch onto and use as an excuse to continue and escalate the US military intervention in Syria at Assad’s expense. Cui bono (“who benefits?”) doesn’t always point to the true answer to a question, but in this case it’s reasonable to ask. The Khan Sheikhoun attack may very well have been carried out by the rebels themselves, in an attempt to keep the US entangled in the war, on their side. Another plausible explanation is that Syrian regime aircraft bombed a rebel facility where the chemical weapons were manufactured or stored, accidentally releasing them. It’s happened before. It’s how a number of American troops, possibly including me, were exposed to sarin during Operation Desert Storm in 1991. Or maybe it was Assad behind the attack, for some reason beyond the ken of distant observers. But who and why are the wrong questions. The third question — the right question — is: Why is the US involved in this war? 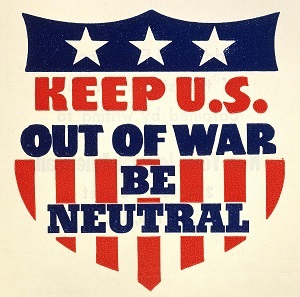 The Assad regime has not attacked the US, nor has Congress declared war on Syria. There’s simply no defensive — or for that matter even legal — rationale for a US military presence in Syria. Whatever horrors the civil war there may entail, American military adventurism makes them worse, not better. It perpetuates instability rather than bringing peace. Donald Trump ran for president on a platform of reducing US military meddling in other countries’ affairs. It’s time for him to follow through and order a US withdrawal from Syria. Thanks to the William Lloyd Garrison Center for Libertarian Advocacy Journalism for the content.